Interested in becoming a recognized sponsor or donor of our company? Only with your donation can we continue to travel with our one of a kind performance from the heart of Mexico. 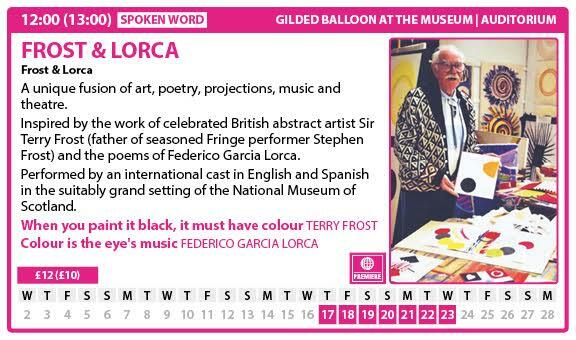 We are taking Frost & Lorca to Edinburgh in August 2017! We have the opportunity to perform at one of the major festivals in the world at The National Museum of Scotland - which suits this presentation perfectly. Our company is based in Mexico and the U.K. - your sponsorship and donations will allow us all to travel to Edinburgh and help fund the production and promotion of Frost & Lorca. Every sponsor and donor will have a place on our program, and in our show, going forward. OUR PARTNERS ARE AN INVALUABLE ASSET TO OUR COMPANY. WE ARE SO GRATEFUL FOR OUR LOCAL PARTNERS AND INTERNATIONAL PARTNERSHIPS.